Looking for a ride – on vehicle for your little one that looks just like a real car? 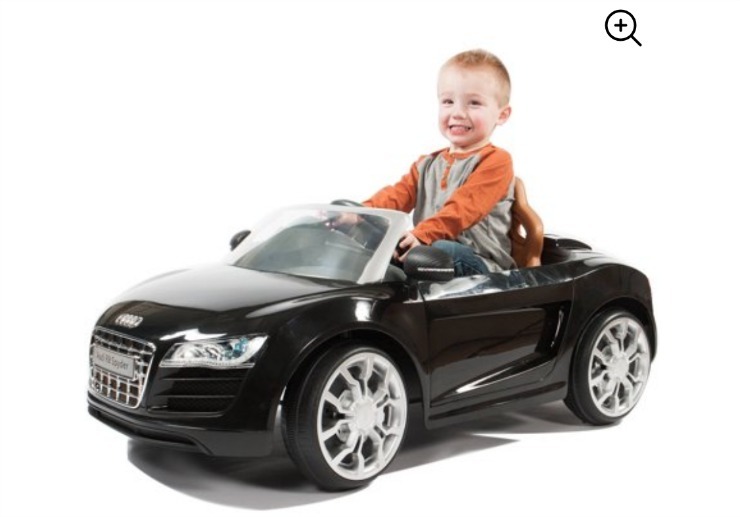 Check out the Rollplay Audi R8 Spyder Ride-On Vehicle 50% off Walmart. Normally $199 but it’s on sale for just $99 plus FREE SHIPPING!. Get yours here. Your little driver won’t be able to get enough of the Rollplay Audi R8 Spyder’s features – this little car features working LED headlights plus a push-button horn and button activated real engine noises. The design of the 6V Audi R8 is sleek black with a high backed faux-leather seat, so everyone knows your child has the coolest ride in town. Featuring authentic Audi R8 details from the steering wheel down to the shiny hub caps, even the grips and tires sport a real-life design for a modern cruising look. Engineered to be a safe choice for young children, the four-wheel 6V Audi R8 features two wheels in front and back to help ensure balance and contribute to hand-eye coordination and confidence as children ride. The rubber non-slip traction strips on each tire ensure stability and give the 6V Audi R8 the ability to handle all terrain from smooth carpeted floors and sidewalks as well as backyard dirt and grass. The cushioned seat is low to the ground so little legs can easily get on and off the ride on their own. Of course, riding is only half the fun: when you add the 6V Audi R8 quality to this car, it comes to life! Watch your child smile, giggle, and play with delight when he/she hears the awesome real-life sound effects and sees the LED headlights light up in the front as he/she plays with the buttons on the dashboard of the exclusive lights and sounds custom sculpted dashboard area. Two additional buttons on the dashboard produce more action-packed sound effects to stimulate imagination and inspire even more adventures. Finally, with a trunk that opens to show off the engine, this ride will make your child feel like he/she is driving the real-life model. The engine is constructed with realistic details for a luxurious look that can’t be beat. Your kids will let you know when to watch out as they honk their horn and make real engine noises as they zoom past at the lightning fast speed of 2.5 MPH in either forward or reverse drive. The 6V Audi R8 Battery Ride-on from Rollplay can run for up to 2 hours when fully-charged. This model is recommended for children ages 3 years and up weighing up to 77 lb. Realistic looking, officially licensed ride-on car has the appearance and feel of a real Audi R8!2.5 maximum speed capabilities for fun and safetyThe dashboard lights up to illuminate every detail – press the wheel for realistic sounds!The trunk opens to reveal the engine’s realistic details for a luxurious look that can’t be beatRecommended for children ages 3 years and up and weighing a maximum of 77 lb. Get Yours Here. Looking for more Black Friday deals? Join our HOT DEALS GROUP on Facebook. You can also check out more Cyber Monday Deals on our blog!